IL&FS Transportation Networks Ltd today said it has won Rs 2,100-crore project in a consortium from the Haryana government for expansion of Rapid Metro Rail of Gurgaon by a further 6.5 km towards southern parts of the city. In a filing to the BSE, the company said that Haryana’s Cabinet on September 28 had approved award of the Rapid Metro Rail Gurgaon South Extension contract to a consortium of IL&FS Transportation Networks Ltd and its subsidiary IL&FS Rail Ltd for developing the 6.5 km rail metro link extension. “The project will be the extension of Rapid Metro Rail Gurgaon System, which is presently under development by the consortium and will run from Sikanderpur station at Bristol Chowk to sector-56 in Gurgaon with 6 stations expected to be covered in 18 minutes,” it said. The consortium is already executing a 5-km Metro rail system connecting Sikanderpur Metro station of Delhi Metro to Cyber city and NH-8 in Gurgaon. The Haryana Chief Minister is scheduled to flag off the trial run of its first phase tomorrow. “The estimated cost of the project is Rs 2,100 crore with a concession for a period of 98 years” and “is expected to be completed in 2015”, the company said. The Haryana government will provide required land for the project, which will be executed under design, build, finance, operate and transfer (DBFOT) basis, it added. Shares of the company closed today at Rs 194.50 apiece on the BSE, up 0.49 per cent from the previous close. CANDIGARH: Haryana cabinet, which met under the chairmanship of chief minister, Bhupinder Singh Hooda here today, approved the project of development of Metro link from Sikanderpur station to sector 56, Gurgaon. This project will have the route length of 6.5 kms. 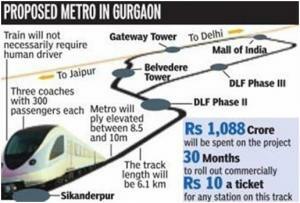 with the project cost of Rs.2143 crore and will run from Sikanderpur station to sector 56, Gurgaon. This project is likely to be commissioned within a period of 3 years. It will make the commuting easier for lakhs of people living on the south side of Gurgaon and will further strengthen the Mass Rapid Transport Infrastructure in Gurgaon. This project will be a boon to the existing Metro Rail Project being developed in the Cyber City of Gurgaon, the trial runs of which will take place on October 2, 2012 in the presence of Chief Minister, Haryana. This project has the provision of further extension of Metro Rail towards old Gurgaon across National Highway, which will also be taken up subsequently for the benefit of residents of Gurgaon living on the north side of Gurgaon. M/s IL and FS Rail Limited will implement this project under the PPP Model and entire cost of the project will be borne by M/s IL and FS Rail Limited. Haryana government will provide ROW on lease hold basis. This is the unique model for implementation of Metro Rail Projects in the country wherein not only the entire project cost will be borne by the private party but it will also be maintained and operated by the private party at its own cost. The private party that is M/s IL and FS Rail Limited will also pay Rs.2010 crore to Haryana Government towards connectivity charges over a period of 20 years starting from 16th year from the date of signing of the concession agreement. M/s IL and FS Rail Limited will also share with the State Government 5 per cent to 10 per cent of the revenue generated from the property development and advertisements rights during the operation period. Therefore, a major infrastructure will come up expeditiously at no cost to the government. At the same time the government will get substantial revenue by providing this permission. Hooda to lay foundation for expansion project in Oct? Haryana chief minister Bhupinder Singh Hooda is likely to lay the foundation stone for the 7-km long southward extension of the intra-city Metro service on October 2. The rail network will be extended up to Sector 56 along the Golf Course Road. To be completed in 36 months, the Rs. 2,100-crore project will have a multi-level parking lot at its last station in Sector 56. Once ready, lakhs of residents of DLF Phase 1, Sushant Lok, Southcity, sectors 54, 55 and 56 and executives working with companies along Golf Course Road would greatly benefit. Those staying beyond Sector 56/57 can park their vehicle at the Sector 56 Metro station and take a train, said Sanjiv Rai, managing director and CEO of IL&FS Rails Limited. A consortium of IL&FS Rail Limited and IL&FS Transportation Limited, the firm was the only bidder for the project in April. Haryana Urban Development Authority (Huda) had floated global tenders. "We have received confirmation from the Haryana government that the CM would laying the foundation stone for the southward extension of the RMG service on October 2," Rai added. He further said, "According to plan, the elevated route will have a double-standard gauge track with a total of six stations. It will begin from Sikanderpur Metro station near Bristol Chowk and terminate at the T-junction in Golf Course Extension. We have asked the state for land to construct a multi-level parking lot at the Sector 56 Metro station." The project will take about six months for financial closure and 30 months for construction. Ideally, the complete route will be ready in 2015. On the westward extension towards Udyog Vihar, Rai said the alignment would be finalised only after the proposed high-speed Metro route between Iffco Chowk and IGI Airport was fixed. The 7-km westward extension project, worth Rs. 2,000 crore, will benefit residents of Udyog Vihar, Sectors 21, 22, 23, 23A, Palam Vihar and sectors carved in Gurgaon Master Plan 2021. Rapid MetroRail Gurgaon Limited (RMGL), the agency which is setting up the intra-city rail network, had held negotiations with the city transport department to introduce feeder buses for the benefit of Old Gurgaon residents. service on three routes — Gateway Tower to Iffco Chowk, Gateway Tower to Kapashera Border and Gateway Tower to Jwala Mill road. The bus service will not only benefit office-goers who wish to use the intra-city link, but also provide direct connectivity to the Delhi Metro. The Rapid Metro connects to the DMRC service at Gateway Tower, which is close to Udyog Vihar and Palam Vihar. Although RMGL would have started its own feeder bus service, the state policy prohibits any such initiative. So, officials have requested the transport department to consider their demand and begin the bus service when trains start running on the tracks by April 2013, said the RMGL spokesperson. "The Rapid Metro will charge a fixed rate for the entire 6.1-km-long stretch. Commuters travelling on the Delhi Metro can use their tokens or smart card to travel on the Rapid Metro," said the official. The fare will be distributed between RMGL and DMRC by the clearing house system. The six-km Metro rail system will connect Sikanderpur Metro station of Delhi Metro to Cyber City and NH-8 in Gurgaon and it is India’s first privately promoted intra-city project. The three coaches of Rapid Metro arrived from German firm Siemens’ facility situated at Guangzhou in China at Mumbai port on August 20. According to RMGL officials, a total of five light-weight, aluminum trains would be imported. Four of these would be used for ferrying passengers while one would be kept in reserve. Each train will consist of three coaches with a total capacity to ferry 1,000 passengers. There will be six stations in the city — Sikanderpur, DLF Phase II, Belvedere Towers, Gateway Towers, Mall of India and DLF III. The rapid metro rail service for Gurgaon, conceived as a joint venture project of DLF and IL&FS, is set to become functional from mid-2013. It is to be fully funded by IL&FS, with DLF not investing, both companies have confirmed. IL&FS is interested in establishing a privately-run metro model in cities through the country, besides extending the 6.1-km stretch being built in Gurgaon by 14-15 km. The project was launched in mid-2009 and was expected to be completed in 30 months, but got delayed due to state government interventions. The cost has risen from the initial projection of Rs 900 crore to Rs 1,088 crore. The current stretch would have six stations. It would connect Sikandarpur, DLF-2, Mall of India and DLF-3 in Gurgaon. In the Special Purpose Vehicle formed for the Rapid Metro Rail Gurgaon (RMRG) project, the investment structure was 26 and 74 per cent for DLF and IL&FS, respectively. Till commercial operation begins, DLF will continue to hold 26 per cent equity in the project, said Sanjiv Rai, managing director of RMGL. After that, IL&FS would get all the shareholding. “DLF was initially to invest in the project. However, it did not. So, it is an IL&FS project, constructed and financed by this company,” said Rai. Of the Rs 1,088 crore investment, 30 per cent is in the form of equity by IL&FS and the remaining 70 per cent is debt from eight public sector banks. IL&FS said it would get all the revenue from ticket sales; a share is to go to Haryana Urban Development Authority from the non-fare revenue. “For the first five years, the company would contribute five per cent of the advertisement revenue to Huda, while in every subsequent year for the next five years, it will be increased by one per cent till it reaches the 10 per cent figure,” said Rai. DLF told Business Standard its interest isn’t in the revenue as much as in the establishment of metro connectivity to DLF Cybercity and Mall of India. “The advantages are better connectivity for the residents of Gurgaon, the workforce in Cybercity and mall visitors. This will also help reduce the cab menace and result in less traffic chaos in the DLF city area,” said the company spokesperson. C V K Rao, senior advisor to IL&FS and earlier a director with Delhi Metro Rail Corporation, said the ticket fare would be the same as set by DMRC. The trains have been sourced from Siemens, the German engineering major. The maximum speed is to be 80 km per hour. “We would look at opportunities in the Delhi monorail, a 10-11 km project, if it is a PPP (public-private partnership),” Rai said. The company is also keen to offer small, connecting feeder metros in Delhi, he added. The Rapid MetroRail Gurgaon Limited (RMGL) has also struck an agreement with the Delhi Metro Rail Corporation (DMRC) for a common ticket system. “It means that passengers would be able to use RMG tickets at Delhi Metro stations and vice versa. We have now started looking for an independent agency for undertaking the work of ensuring smooth revenue sharing between the two metro companies. Every evening, the agency would furnish segregated travel at RMGL and DMRC stations,” said RMGL spokesperson Sarvesh Tiwari. RMGL is a consortium company of IL&FS and DLF, which has funded entire R1,088 crore for this project. The track consignment had arrived here from Austria last month. 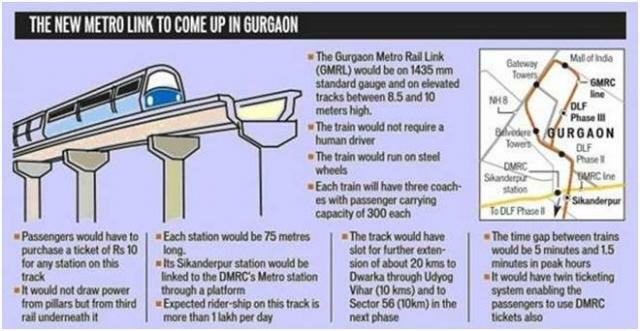 Unlike DMRC’s Metro tracks, trains in this project are going to draw power from the third rail laid in the middle of both the tracks to give asthmatics look to suit the swanky structures of the DLF City through which the trains would meander, company officials said. Workers have laid about 30 metres of the track on the 6.1-km-long route. “The work of laying steal tracks has taken off from U-Block and the engineers have already laid more than 30 metres,” Tiwari said. Come July and the trial run of India’s first 100% privately funded and operated light rail transit service, Rapid MetroRail Gurgaon (RMG), would begin, easing commuting woes of lakhs of residents. would begin in the next few days. The consignment of equipment, including the insulated third rail, has also arrived from Austria. The third rail is a method of providing electric power to a train, through a semi-continuous rigid conductor placed alongside or between the railway track. Unlike the Delhi Metro Rail Corporation (DMRC), the Rapid Metro trains are going to draw power from the third rail in a bid to do away with overhead electric poles. Built on lines of the Dubai Metro, the Rapid Metro will maintain the aesthetics of the city and suit the swanky glass structures of DLF City through which the trains would meander, company officials claimed. Five aluminum-body Siemens trains are likely to arrive in Gurgaon from China in May after the tracks have been laid. Though this R1,000-crore project had a slow beginning due to land acquisition and transfer issues, officials are hopeful of meeting the January 2013 deadline, within the designated 30 months' construction time. “We have received a consignment of steel tracks from Austria and the work to lay them would start by this weekend. The tracks would be ready by May after which we will start laying the insulated third rail. Five trains will arrive from China in May and by July, we expect to start the trial runs,” said Sarvesh Tiwari, head of media and communications, Rapid Metro Rail Gurgaon Limited, a special purpose vehicle (SPV) company of INTL Enso Rail Systems (IERS), a unit of IL&FS and DLF. Gurgaon’s Rapid Metro and the Delhi Metro are planning a link to enable commuters of both facilities to switch between the two with ease. The meeting point for the two has been shortlisted as the Sikanderpur Metro station, where the DMRC line (Jahangirpuri to HUDA City Center) will be integrated with the upcoming 5-km-long Rapid Metro line, which connects several residential and commercial areas in Gurgaon. The project is expected to complete by early 2013. According to officials, Rapid Metro is on standard gauge, and, therefore, it cannot be linked directly to the Delhi Metro, which runs on a broad gauge. The new station of the internal Gurgaon Metro at Sikanderpur is being connected with a sky-bridge, to connect the two lines directly. The 900-metre-long and 9-metre-wide sky-bridge will be a direct connect between the paid areas of both the Metro lines. To enable smooth interchange of passengers, both lines will have common ticketing and commuters interchanging at this station need not buy separate tokens for travel. The Rapid Metro will run in the form of a loop starting from Sikanderpur leading to DLF Phase-II, from where it will branch out and cover four other stations — DLF Phase-III, the proposed site for Mall of India, Gateway Towers and Belvedere Park. Officials estimate that around 10,000 passengers will interchange every hour between the two lines, during the peak-hour slot. Around 2 lakh commuters are expected to use the station for interchange daily. Officials said the connectivity will help a large number of shoppers, office-goers and residents in DLF phases II and III. “The frequency of trains on the Rapid Metro will also be synchronised with Delhi Metro to facilitate easy and quick commuting for passengers. The internal Metro link will act as a feeder to Delhi Metro’s Gurgaon corridor connecting the Capital,” said Sarvesh Tiwari, spokesperson for Rapid Metro. The construction of Rapid Metro project started in July 2010, and almost 40 per cent of the civil work has been completed. “The rolling stock for the project will reach the site in May 2012, and the testing and commissioning will start by May 2012. The commercial operations are slated to start by the first quarter of 2013,” Tiwari said. Haryana government officials said the detailed project report to extend the internal link from Sikanderpur to Gurgaon Sector-56 has already been prepared, and tenders for the project are likely to be floated in six months’ time. The 7-km extension will have six stations. Yet another extension of the internal Metro link is being planned from NH-8 to Old Jaipur Road, with a station at Maruti Udyog, where the line will again be integrated with an upcoming high-speed corridor from IFFCO Chowk to Dwarka Sector-21. GURGAON: A memorandum of understanding (MoU) for operation of Rapid Metro Rail in the city was signed between the ministry of urban development, state government and Delhi Metro Rail Corporation (DMRC) on Thursday. "We need to find innovative financial methods either in PPP or fully private mode to fund Metro projects. Haryana has taken the first step in giving a Metro project to a private company," said Kamal Nath, urban development minister. RMGL is developing a 5-km metro rail link between Sikanderpur metro station and Cyber City at a cost of Rs 1,088 crore. The project is designed for a daily capacity of 2 lakh passengers. The concession agreement for the project was signed in December 2009 and construction started in July 2010. With about 40% of the civil work already completed, the rolling stock is likely to reach the site by May 2012. RMGL plans to do testing and commissioning by May 2012 before the scheduled launch in March 2013. Haryana chief minister Bhupinder Singh Hooda said plans were afoot to expand the private Metro network to 20km in Gurgaon. The state has already planned for the north-south extensions for the project – about 7km in each direction. The detailed project report (DPR) for the extensions is being prepared and the tenders may be floated soon. This is the first private initiative in India. GURGAON: The state government has set up a new company, Haryana Mass Rapid Transport Corporation (HMRTC), to develop and provide urban transport services like Metro rail, buses and taxis. The company will run all kinds of vehicles to ensure smooth transportation of people and goods in urban areas. It will design and construct rolling stock, tracks, signalling and telecommunication systems or automatic fare collection systems for successful Metro links and other means of rapid transport. On Wednesday, chief minister Bhupinder Singh Hooda approved authorized capital of Rs 100 crore for the company which would have paid-up capital of Rs 10 crore. The equity participation of the state government would be 51%, that of HUDA would be 29% and of Haryana State Industrial and Infrastructure Development Corporation (HSIIDC) would be 20%. The chairman and managing director of the company shall be appointed by the government and he will be a senior serving or retired officer of the state not below the rank of secretary to the government of Haryana. The idea of such a company was proposed before Haryana Vidhan Sabha in March 2010. The location of HMRTC's registered office has not been finalized yet, even as many experts believe that being the fastest growing urban area in the state the Gurgaon-Manesar region should be a preferred destination for the headquarters. The Cabinet also revised the lumpsum tax rates prescribed in respect of Brick Kiln Owners by amending Haryana Valued Added Tax Rules, 2003 thus raising it by 15% with effect from the date of issue of notification. As per the revised rates, for brick kiln of capacity of more than 33 columns (Ghori) and falling in plus A category, the lumpsum payable in lieu of tax would be Rs 3,09,120 plus Rs 10,765 per additional Ghori above 33 Ghoris. The Rapid Metro Gurgaon Limited (RMGL) has awarded the contract for implementing the ticketing system of the project to Thales, a French company. The Rapid Metro will connect the Delhi Metro line, improving connectivity in Gurgaon. RMGL officials maintained that as the project will have a twin ticketing system, it was important for them to get a contractor that has been employed by the Delhi Metro. “We had invited tenders for the ticketing project on the Rapid Metro. Thales had been working with DMRC on different projects. We will also have a twin ticketing system that will allow passengers to travel on the Delhi Metro as well Rapid Metro routes by using just one token. Thales can fulfill our needs because it has worked with Delhi Metro,” an RMGL spokesperson said. Thales will develop a central back office system to deliver complete automatic fare collection services to the Rapid Metro, and install 72 automatic gates and associated IT systems at all stations, a press release from RMGL said. The system will ensure seamless journeys for passengers and secure revenue collection for operators. Entries and exits to Metro stations will be controlled by gates that can be activated through smart cards. Stretching across 6.1 km and having six stations, the planned route for the Rapid Metro will connect to the Delhi Metro at Sikanderpur, bringing Gurgaon closer to Delhi. The project is scheduled to be completed by January 2013. The six stations planned on the stretch are Sikanderpur, DLF-2, Belvedere Park, Gateway Tower, Mall of India and DLF-3. The project would cost around Rs 1,100 crore. The Rapid Metro will benefit from natural lighting, less air and sound pollution, landscaping, automatic exhaust, silent generators, dust-catchers and water treatment plants. CCTV cameras and special screen doors will be installed to ensure commuter safety. The length of each platform will be 75 metres, and the frequency of trains will initially stand at 90 seconds. 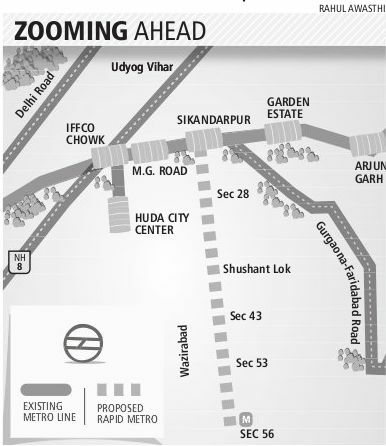 There are plans to extend the Metro by seven km, towards Sector 56 and Old Jaipur Road, in the future. Delhi Metro Rail Corporation managing director E. Sreedharan on Saturday inspected the progress of the Rapid Metro system in Gurgaon. He inspected the station structures as well as all other vital sections of the corridor. After the visit, he expressed satisfaction with the quality of work and said the project would be a boon for the city. During the visit, Dr. Sreedharan was accompanied by several senior officials of the DMRC and Rapid Metro. Among them were DMRC directors Mangu Singh and Satish Kumar. Rapid MetroRail Gurgaon Limited (RMGL) managing director Sanjiv Rai, along with his Head of Departments, accompanied the DMRC team. Mr. Rai himself explained the special features of the project. Dr. Sreedharan travelled through the entire section of 6.1 km. The visit started from Sikanderpur, where the Rapid Metro station will be inter-connected with the DMRC station through a foot over bridge. A technical presentation was also made at the Sikanderpur site office by various technical Heads of Departments of the Rapid Metro. RMGL Adviser C.B.K. Rao, who was earlier a director with DMRC, explained the safety and quality features of the project. Senior vice president (project) H.S. Chaudhary explained the finer details of the project execution. Two other senior officials, Parveen Kumar and K.S. Sharma, explained the signalling and electrical arrangements. Mr. Rai further discussed the future expansion and the status of the project. The concept of ‘twin ticketing' was also discussed and Dr. Sreedharan advised that it will not only add to the number of commuters, but ensure a hassle-free journey. Expanding its existing network, the Haryana government has finalised a new Metro route from Sikandarpur to Sector 56-57, in Gurgaon. The new route, almost seven km long, will connect the Delhi Metro Line 2 (Central Secretariat-Gurgaon) at Sikandarpur and is expected to have nine stations. This would be the second private Metro venture in the state. A 6.1-km loop emanating from Sikandarpur, connecting the same Delhi Metro line with various DLF sites, is already under construction. The company — Rapid Metro Gurgaon Ltd (RMGL) — which has undertaken the project, plans to construct six stations on this loop at DLF Phase 2, Belvedere Tower, DLF Phase 3, Gateway Tower and Mall of India. This stretch is expected to become functional in the first quarter of 2013. “We expect that trials on this loop will begin by the end of 2012. Once operational, we may extend the loop to Udyog Vihar and, if possible, till the Maruti factory. This would be another 2.5 km towards NH-8,” said Dhillon. The RMGL, a consortium of DLF Metro (24 per cent) and IL&FS (76 per cent), is said to have already submitted detailed project reports to the Haryana Urban Development Authority (HUDA) proposing to be considered for the Sikandarpur-Sector 56 stretch and the extension towards Udyog Vihar. “It is immaterial (who is interested). Open tenders would be invited,” said Dhillon. He added that since the Sikandarpur-Sector 56 stretch is likely to draw a large number of passengers, HUDA is expecting better returns (compared to the first project) by tendering out the work to a private company. “For the first project, HUDA and the RMGL Ltd signed an agreement in 2008 to share project revenue. Other than a Rs 5 crore, which the consortium paid HUDA, it has to pay Rs 40 crore each year from the seventeenth year onwards till the thirty-sixth year as connectivity charges,” Dhillon said. “HUDA is expected to gather better remuneration from the new venture in the form of connectivity charges,” he added. The HUDA office has been asked to provide a free-from-encumbrances area for the construction of the elevated line. “Less than two acres is needed for the project,” said Dhillon. Siemens Mobility has signed a contract with the Rapid Metro Rail Gurgaon (RMGL) to build a new metro line connecting Gurgaon Cyber City to Line 2 of the Delhi Metro (DMRC), via the connecting station of Sikanderpur. For this project, Siemens will implement total rail solutions, ranging from coaches and electrification to signaling and system integration, a press release issued here today stated. The project is scheduled to be commissioned by the end of 2012 and, once complete, the new 6.1-kilometre stretch will help commuters reduce their travel time significantly. For this project, Siemens will provide end-to-end rail solutions from a single source, besides five three-car metro coaches of aluminum design. The coaches will run on the standard-gauge elevated track at an average speed of 30 kilometres/hour. To ensure minimum headway of 90 seconds between two trains during peak hours, Siemens will install an advance signalling and automatic train control system. This system will enable transportation of up to 30,000 passengers per hour. To ensure reliable and safe operation, Siemens will install state-of-the-art electronic inter-locking, automatic train control and supervision systems, the release said.For complete line electrification, Siemens Mobility will equip the traction power supply with DC 750 V, including a third rail system for power collection. Speaking on the project, RMGL CEO Sanjiv Rai said, "The construction of the new metro line will mark a significant milestone in our endeavour to provide state-of-the-art transportation solutions to Gurgaon. We have chosen to partner with Siemens as they have demonstrated exceptional capabilities with their global technological expertise. We are confident that Siemens will bring tremendous value to this project as a single-source partner." This is for the first time in India that a complete metro rail project has been financed by the private sector. The RMGL is a joint venture between ITNL ENSO Rail Systems Ltd (IERS), IL&FS Transportation Networks Ltd (ITNL) and DLF. Commenting on the order, Siemens Ltd managing director Dr Armin Bruck said, "This project was won on the basis of our ability to fully integrate solutions with the highest degree of quality and reliability. Keeping in mind our track record in rail projects, Siemens is strategically poised to provide solutions to India's transportation challenges." 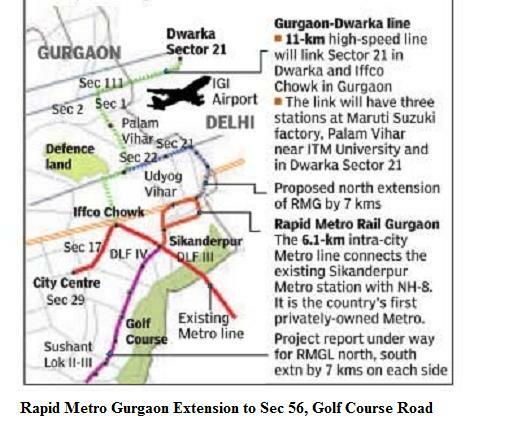 Gurgaon private metro is set to dramatically change the connectivity of Golf Course Road when it would be expanded upto Sector 56 along the golf course road in second phase. One of the reason why DLF has taken over maintenance work of Golf Course Road is that it will help DLF to build metro track above Golf Course Road in the very near future. Rapid Metro Rail Gurgaon Limited has planned to start the metro rail service in Jan 2013 in Millenium Cityfrom Sikanderpur Metro Station touching DLF Cybercity ends at Mall of India and Gateway Tower before entering to Delhi. India’s first privately funded, promoted by DLF and ILFS, will be good mode of transportation. Slated to begin in January 2013, the service meanders through DLF City and touches corners at DLF Cybercity, that has a horde of multinational companies. Promoters say they have designed it with world-class aesthetics. Starting from Sikanderpur Metro station, the RMG would meander through the posh DLF City (II) and touch Belvedere Park and Towers, DLF Cybercity, National Media Centre, Ambience Lagoon apartments before turning towards DLF SEZ in DLF City III. Other locations include Hotel Leela Kempinski, Ambience Mall, Hotel Trident Hilton and border Toll Plaza on Gurgaon Expressway. Besides features such as the Automatic Train Operation (ATO) system, that does not necessarily require human drivers; the aesthetics of the entire 6.1 km long metro service would be on the lines of the Dubai Metro, officials of the special purpose vehicle (SPV) company Rapid MetroRail Gurgaon Limited (RMGL) claimed. The aesthetic designs of 47 stations (nine underground) on the 75-km long Dubai Metro network is said to be the latest and most attractive in the world. Sanjiv Rai, managing director of RMGL said, “Our consultants would design RMG stations in such a way that they merge well with the swanky buildings in the area,” Rai added. In July 2009, the Haryana government had awarded the Rs. 1088 crore-project of setting up 6.1 km-long to RMGL. However, it is yet to receive formal nod from the union ministry of urban development. This service would also act as a feeder system for DMRC’s main metro service. Rai said RMGL would be signing lease agreements with the Haryana Urban Development Authority (HUDA) as well as with DLF in the next few days. DMRC would be the Prime Maintenance Consultant for the project. The civil contract has gone to Maytas Infrastructure that promises to finish its work of erected elevated track within 24 months. 5 km Metro rail system connecting Sikanderpur Metro station of Delhi Metro to Cyber city and NH-8 in Gurgaon. Delhi Metro line connecting Central Secretariat to Sushant Lok will be operational in 2010. This project will provide a feeder line to Delhi Metro and serve commuters travelling to Cyber city / NH-8 from Delhi or other parts of Gurgaon. More than 26 million square feet of floor space is under development in Gurgaon Cyber City along Vishwakarma Marg and NH – 8. Due to lack of any public transport this area experiences heavy traffic congestion all through the day. At times during peak hour, time taken in commuting from NH-8 to Sikanderpur is around 45 minutes. When the whole Cyber City is fully developed, there would be employment for around 400,000 persons. The present Vishwakarma Road, even after widening, will not be able to cater to the road vehicles that will be taking these people to the Cyber City and vice-a-versa. Thus there is a necessity for providing a faster link in the form of a metro for the convenience of the commuters. Keeping this into account, Haryana Urban Development Authority (HUDA) has decided to develop a light metro system, which will provide an active and speedier link from various parts of Cyber City to Sikanderpur Metro Station. The services of RITES were commissioned in 2007-08 to carry out the feasibility study for the development of a Mass Transit System (MTS). Based on the report Haryana Urban Development Authority (HUDA), invited bids for Design, Engineering, Finance, Construction, Operation and Maintenance of the metro link on Build, Operate and Transfer (BOT) Basis. The Consortium of IL&FS-DLF were awarded the Project in July 2009. A Special Purpose Vehicle (SPV) named Rapid MetroRail Gurgaon Ltd (RMGL) has been formed to execute the Project. The line will be ready in early 2013 for commercial service. Consortium of two IL&FS group companies (ILFS Transportation Network Ltd-ITNL and ITNL Enso Rail Systems-IERS) and DLF. There are plans to extend this line in North direction (up to Dwarka) and South direction (sector 55-56). Once the extensions are completed total route length would be around 20 kms.